Liverpool were probably not expected to had a particularly busy January transfer window, but they surely have to spend now. Reports have emerged today of right-back Trent Alexander-Arnold being out for a month, with the Liverpool Echo claiming he has a knee ligament injury. The Reds already have Joe Gomez and Dejan Lovren out, and simply don’t have the depth to cope with this kind of injury crisis. With Jurgen Klopp’s side four points clear at the top of the Premier League table – now is not a time to be careful with money if they want to give themselves their best chance of ending their 29-year title drought. One of the most solid centre-backs in the Premier League at the moment, James Tarkowski could be a fine option for Liverpool to think about. The Sun have in fact already linked the England international with LFC in a possible loan move, but Burnley want £50million for the player. Either way, Liverpool should shift Fabinho out to right-back until Gomez and Alexander-Arnold return, and bring in an upgrade on Lovren in the centre, with the Croatian not the most reliable option anyway. A quality young player not getting much first-team football at the moment, Andreas Christensen could surely be available from Chelsea for a reasonable price, or perhaps also on loan. 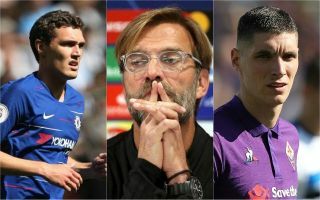 Of course, rivals don’t love doing business together, but plenty of players have moved between these two in recent times, such as Fernando Torres, Yossi Benayoun and Daniel Sturridge. Christensen would not only be good cover for Liverpool now, but a superb long-term option for the club to upgrade on mediocre players like Lovren and Joel Matip. Another very solid player not seeing much playing time at the moment, but who can operate at centre-back, right-back or left-back. In other words, the Spaniard, who scored one of the goals of the tournament at the World Cup by the way, is the perfect squad player to cover in a number of positions in precisely this kind of situation.